Faster, more effective with enhanced comfort! As many people have already discovered, CoolSculpting technology from Zeltiq is an amazing way to shed fat cells from specific areas of your body, which seem to resist even stringent dieting and exhausting exercise. Envision Medical Spa in Leduc has been involved with CoolSculpting for many years already, as it offers a natural way to lose fat in a non-invasive manner and with minimal discomfort. For those new to the therapy, CoolSculpting is a process known in scientific circles as "cryolipolysis" which is a lLatin term for "freezing fat". In the procedure, an applicator gets applied to a treatment area and the temperature of the fat deposits in the region is then lowered enough to kill the fat cells. These cells are then shed from the body over time making the process perfectly natural and gently gradual. Following Zeltiq's impressive launch of the CoolSculpting system, ongoing improvements to the technology have been made which resulted in the next generation "CoolAdvatage" therapy which boasted treatment times almost twice as fast as the previous units and with a significant reduction in reports of discomfort from patients. Recently, however, Zeltiq introduced the CoolSculpting "Petite" applicator which, unlike the previously available applicators, was compact enough to do a better job on smaller areas of the body, such as the undersides of upper arms. For medical spa owner and lead clinician, Brenda, it is the tool she needed to offer a wider selection of treatment areas. "It's a game changer," she enthused. According to Dr. Jean Carruthers of Carruthers & Humphrey Cosmetic Dermatology in Vancouver, who was part of the team Zeltiq used to test their device, the Petite attachment more than fit the bill. "The upper arm, with its delicate structures, is one of the most challenging areas for fat reduction," Carruthers said in her report, "As one of the principal investigators for the CoolAdvantage Petite applicator, I can attest to the fact that the upper arms responded beautifully and my study patients are delighted by their results." 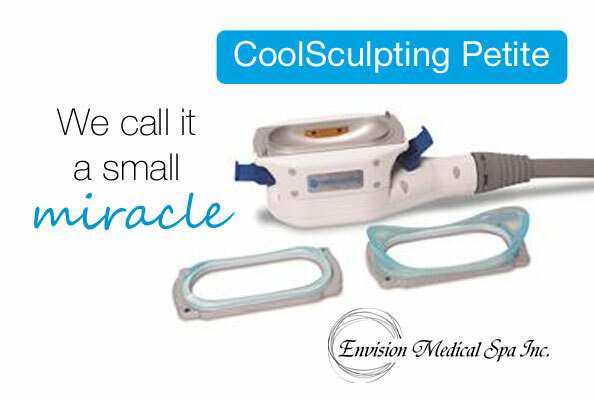 If you think the CoolAdvantage Petite may be the answer you're looking for, give Envision Medical Spa and call and let's discuss your treatment options. At just 35 minutes a treatment and your discretion assured means you do have time to get it done without anyone else being the wiser. Call Envision for your free consultation about the new CoolAdvantage Petite, whenever you're ready.